August 2016 marked the fortieth anniversary of the Grunwick dispute, commemorated by the ‘We are the Lions’ exhibition, which celebrated the efforts of the strikers and considered the wider political, social and racial implications of the dispute. The focus of this paper is on the media representation of Grunwick, specifically of the South Asian women involved. Firstly, a brief summary of the dispute will be given to set the context for the analysis of the media representation. Grunwick was a mail-order, film-processing business based in London and owned by George Ward. The majority of the workers at the factory were female non-British-born immigrants, predominantly South Asians who had migrated from East Africa. The strike began on Friday 20th August, during the hot summer of 1976 when four Asian men walked out of the factory. They were followed shortly after by Jayaben Desai, who became one of the strike leaders. The causes of the strike are complex and include: the exploitative treatment of the predominantly migrant and female workforce, poor working conditions, compulsory overtime, low wages and communal solidarity of the predominantly South Asian workforce. The strike gained support quickly, with 132 workers demanding Trade Union recognition by the following Monday. The strikers were advised to contact the Association of Professional, Executive, Clerical and Computer Staff, who agreed to unionise the workers. The dispute escalated when Trade Unionists came to support the strikers’ demand for Union recognition, resulting in mass pickets during the spring and summer of 1977 and a boycott of postal services to and from Grunwick from November 1977. The Trade Union presence resulted in a much greater and more aggressive response from the police and considerable media attention due to the violent scenes between the police and the pickets. The Labour Government commissioned the Scarman Inquiry to investigate the causes of the dispute in an attempt to find a solution. The subsequent report recommended that the workers should be reinstated and their right to unionise should be recognised. Ward however did not accept the recommendations and as it became increasingly unlikely that a solution would be found, the Trade Union movement withdrew their support. 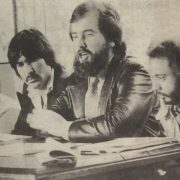 The strikers resorted to a hunger strike outside the headquarters of the Trade Union Committee, the failure of which led them to call off the dispute on 14 July 1978, without gaining Union recognition. There exist only limited accounts of the Grunwick dispute. Rogaly’s narrative focused on the industrial consequences of the dispute, arguing that the legality of mass picketing and the power of the Trade Unions should be challenged. Napier explored the legal significance of Grunwick, claiming that the central issue was the ‘conflict between our much cherished tradition of individual liberties and the principle of collective action’. These accounts demonstrate the wider political implications of the dispute, including the changing relationship between the government and the Trade Unions. Ward’s account was used to defend his actions during the dispute, claiming that the over mighty Trade Unions threatened his individual freedom. The Trade Unionist perspective is provided by Dromey and Taylor. They celebrated the dispute as a turning point in Trade Union history due to the recognition of the ‘other’. Wilson, however, challenged this celebratory narrative in her feminist interpretation, highlighting how the involvement of South Asian women challenged traditional attitudes to only a limited extent. Sexism and racism remained entrenched within the Trade Union movement despite the Grunwick experience. The historiography on the Grunwick dispute is also limited, with the majority of research focusing on the significance of the dispute for industrial relations as well as the broader political consequences. McGowan seeks to contextualise Grunwick within the broader narrative of the ‘shift to the right’ in British politics during the 1970s, arguing that the mass pickets gave legitimacy to Thatcher’s punitive policy towards Trade Unions. The experience of the strikers has received insufficient historiographical attention, with the exception of the series of articles by McDowell, Anitha and Pearson. Their work has provided the academic inspiration for this article. They argue that the media reinforced the stereotype of the passive and exotic Asian woman, which undermined their identities as workers as well as their political goals. 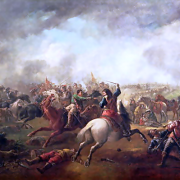 This article extends their research by addressing to a greater extent the persistence of imperial attitudes in how they were represented, suggesting that the media found it difficult to come to terms with the increasingly diverse, post-colonial nature of British society. Furthermore, this paper will place greater focus on understanding the purposes of ‘othering’ in relation to the differing political ideologies and agendas of various media types. As the focus of this paper is on media representation, a wide range of sources will be analysed, including broadsheets, tabloids, magazines and radio coverage from online archives, the Modern Records Centre and the Brent Council archive. The political ideologies of the media types must first be defined, as this is integral to understanding the purposes of their representations. The tabloid newspapers, the Daily Express, Daily Mail and the Sun and the broadsheet newspaper, the Daily Telegraph were the most right-wing of the national dailies. The London dailies, the Evening Standard and the Evening News, were also right-wing in their representations. The Times, the Guardian, the Daily Mirror and the London Broadcasting Company radio station sought to present both sides of the dispute. The Times, was the most right-wing of these, showing greater support for the management. The left-wing perspective was presented by the socialist newspapers, the Morning Star and Tribune and the revolutionary socialist newspapers, the Socialist Worker and Newsline. The feminist perspective was presented by Spare Rib, a magazine that played an important role in the women’s liberation movement. Representation of the ‘other’, with respect to race, gender and class is used to maintain visions of social order within society. The primary way in which this is achieved is through stereotypes, which focus on simplified characteristics to limit the range of representations and fix meaning. Images have no fixed meaning and are dependent upon the dominant system of meaning and historical context in which they are set. The meaning of images is created through the conjunction with text, which gives the media power to fix the meaning of the images they publish. The viewer creates meaning through constructing him or herself in a position of identification with what is depicted in the image. Difference is essential to the creation of meaning through representation. Absences are as important as what is present in the representation to create meaning. The first section of this article will address the representation of ethnicity, focusing on the role of the media in exoticising the women and the persistence of imperial attitudes. The representation of gender will be discussed in the second section, focusing on the reinforcement of traditional conceptions of femininity. These sections demonstrate that, by emphasising the constructions of ethnicity and gender, the media undermined the women’s identity as workers and prevented them from being considered as political activists. The final section will address the representation of class, focusing on the contrast between the left- and right-wing media regarding the emphasis placed on class-based issues, and highlighting the complexity of the women’s class position. The representation of the women in the memory of Grunwick will be discussed in the epilogue, focusing on media coverage of the fortieth anniversary of the dispute and the ‘We are the Lion’ exhibition to demonstrate both the persistence and subversion of stereotypes. Although the paper deals with ethnicity, gender and class separately, it is important to note that there is a deep interpenetration between these constructions in the identity of the South Asian women. The media representation tended to focus on certain aspects of their identity, thus undermining the complexity of the women’s broader intersectional identities. This paper will therefore seek to demonstrate the greater complexity of the women’s identities as a result of intersectionality and their migratory histories. Before analysing the media representation of ethnicity in the Grunwick dispute it is important to discuss the theory of racial formation and the creation of the exotic ‘Other’. In their theory of racial formation, Omi and Winant regard ‘othering’ as part of the process of ‘race-making’. The idea that ‘social identities of marginalised groups are imposed by dominant social groups’ can be applied to the construction of the exotic ‘other’. This ‘other’ should therefore be seen as a social and political construction, like all forms of race. 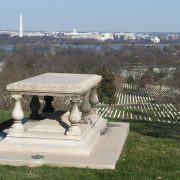 Poets, novelists, philosophers, political theorists, economists, and Imperial administrators, have accepted the basic distinction between East and West as the starting point for elaborate theories, epics, novels, epics, social descriptions and political accounts concerning the Orient, its people, customs, “mind,” destiny, and so on. There is, therefore, an on-going exchange between ‘the academic and the more or less imaginative meaning of Orientalism’ which extends knowledge of the East throughout Western culture and helps such knowledge become hegemonic. Webster considers the large extent to which these imperial mentalities have been transferred to the post-colonial British context. 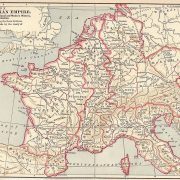 Despite the loss of Empire, the ideas of Western superiority still dominated the representation and treatment of migrants. 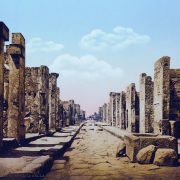 Greater historiographical focus on the cultural sphere can therefore challenge the minimal impact thesis that the ‘empire was lost in a fit of absence’. Through an analysis of the media representation of Grunwick, this article continues the trend of placing emphasis on cultural analysis to demonstrate the influence of imperial attitudes in post-colonial Britain. The media constructed the South Asian women as exotic by focusing on the markers of their ethnicity. Barnard states that clothing is an important way of constituting an individual’s cultural, sexual and class identity. The media therefore focused on the sari, worn by some of the women, to emphasise their ethnic identity. The sari as an object does not have a fixed meaning, rather it is what Sassure refers to as ‘a signifier’. The characterisation of the sari as exotic is dependent on the dominant system of meaning in which it is represented. The predominantly white British audience would have interpreted the sari as exotic because it is not a piece of clothing that is traditionally worn by white Britons. The Daily Mail emphasised the exoticness of the sari, noting that they were, ‘sadly inadequate for the cold of a sullen English midsummer morning’. Focusing on the appearance of the women emphasised their exoticism and in turn made them interesting to the white British reader. The focus on the sari also emphasised the difference between the Asian women and the predominantly white male pickets, representing the traditional British worker. Clemente argues, in her analysis of female strike action in the United States, that the focus on clothing by the media shows an unwillingness to give women respect as strikers and as workers. This can be applied to the media representation of Grunwick, where the appearance of the women was prioritised over the causes of the dispute. Morning Star published an article entitled ‘Sari Power’, describing a scene in which, ‘the high road suddenly exploded into a blaze of colour… In the vanguard, saris swirling, were the Indian women’. As suggested by the title, the focus of this article is upon the appearance of the women, involving considerable descriptive attention to their clothing. Insufficient attention is, therefore, given to the women’s socio-political concerns. The article aimed to present the ‘vanguard’ as more inclusive because of its embrace of the ‘other’. The author focused, however, upon the differences between the Asian women and the rest of the ‘vanguard’ and as a result does not fully accept the women as workers. This highlights the limitations of the left-wing media in the late-1970s in terms of their inclusion of minorities in representations of the working class. The exoticism of the South Asian women was further emphasised through comments on their diminutive size. The Evening Standard described the women as being ‘dwarfed by the police’ and therefore they ‘seem terribly vulnerable’. Thus, the exoticism of the women was emphasised because of the height difference between themselves and the policemen. 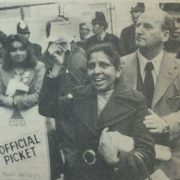 Comments on size in the media coverage most often referred to the strike leader, Jayaben Desai. Morning Star referred to her as, a ‘small, bright Tanzanian Asian lady’ and Time Magazine described her as a ‘tiny immigrant from Tanzania’. Dromey and Taylor also made several comments on Desai’s size, describing her as a ‘slightly built, middle-aged Indian women, four feet ten inches high’. The exoticism of Desai as a result of her size is further reinforced through images, demonstrating the importance of conjunction with text to create meaning. A dominant image repeatedly used in the media coverage to represent the strikers shows Desai standing alone in front of a sturdy rank of uniformed police. Desai’s ‘otherness’ is emphasised because of the difference in appearance between herself and the police. Selectivity of photography further emphasises this difference, most notably in the image of Desai surrounded by a male crowd, published in The Times. The photographer took the shot from above, exaggerating the height difference between Desai and the surrounding male crowd. As a result of the emphasis on the women’s exoticism in the right-wing media, the women were separated from the negative representation of the pickets. The Evening Standard demonstrated sympathy for the ‘dutiful’ strikers while opposing the actions of the mass pickets. Thus, the right-wing media remained sympathetic towards the women by emphasising their exoticism. This sympathy, however, depended on undermining their identity as political activists. The media coverage of the strike also demonstrated the persistence of imperial attitudes due to the patronising representations of the strikers. The strike committee only had limited experience of British Trade Unionism and consequently relied upon the expertise of Jack Dromey, secretary of Brent Trades Council. The media, however, exaggerated this reliance, representing a paternalistic relationship between Dromey and the strikers. Due to their focus on images, this is an aspect of representation that is not recognised by McDowell et al., as it is more prominent in the language used to describe the relationship between Dromey and the strikers. The prominence of the paternalistic tone in the media representation of the strikers supports Lahiri’s argument of the persistence of imperial attitudes in the treatment towards migrants as colonial subjects. They were often treated as children in need of protection. The theme of paternalism was presented more subtly in the left-wing media. Morning Star used quotes from Dromey as representative of the strike committee, suggesting that they were regarded as incapable of speaking for themselves. Dromey himself reinforced the image of the strikers as in need of protection and guidance, referring to them as a ‘bunch of lost chickens’. The left-wing media also reinforced the paternalistic relationship through visual representation. News Line used an image of Dromey speaking while the other members of the committee lean towards him to listen. Thus, Dromey is depicted as the authoritative figure of the committee. Morning Star reinforced the paternalistic relationship between the strikers and the political left by using an image where the Communist Party’s General Secretary, Gordon McLennan, has his hand on Desai’s arm. This can be interpreted as a protective gesture. These paternalistic representations reflect the left-wing’s perception of their own Western superiority over the Asian men and women. Furthermore, the prominence of paternalistic attitudes demonstrates that despite recognising the ‘Other’ through their support in the Grunwick dispute, racist and sexist attitudes remained entrenched within the Trade Union movement at this time. The theme of paternalism, however, is most clearly apparent in the right-wing media’s representation. The Times, for example, published an article entitled ‘Picket organizer regarded as a father figure’. Throughout the article the paternalistic relationship between Dromey and the strikers is hammered home, noting that, ‘he [Dromey] is undoubtedly the leading force behind the organisation of the pickets’. The Evening Standard also demonstrated similar paternalistic attitudes stating that, ‘the Asians regard him [Dromey) as something of a father figure’. Emphasising the paternalistic relationship enabled the right-wing media to remove the agency and power from the strikers, meaning that they were not represented as a threat to their ethnocentric vision of social order. The unequal relationship between Dromey and the strikers also demonstrates the persistence of imperial attitudes as the white male is portrayed as the protector of the ‘other’. The patronising attitudes of the media towards the strikers are also demonstrated through references to their perceived ignorance. The Guardian patronised the strikers by focusing on their lack of knowledge of the English language, referring to them as ‘noisy and incoherent immigrants’. Socialist Worker also patronised the strikers by emphasising their lack of industrial experience. The assumption that the strikers have no knowledge of industrial experience shows that the left-wing overlooked the tradition of the Indian Labour Movement in Britain, including their involvement of Asian workers in the Mansfield Hosiery Strike (1972) and Imperial Typewriters Strike (1974), in which they received no Trade Union support. Socialist Worker sought to depict the strikers as ignorant because it validated the takeover of the dispute by the Trade Union movement. Nevertheless, some of media coverage did seek to subvert the stereotypes of South Asian women as ignorant and a-political. This demonstrates the complexity of representations as stereotypes were both reinforced and challenged. However, such representations can still be regarded as patronising as they characterised the South Asian women as unexpected heroines. The emphasis upon the heroism of the South Asian women provides evidence to support the argument that, ‘melodrama marks the place of this figure in popular (including feminist) discourse with extremes of victimhood and heroinehood’ and are ‘especially loved when they strike’ as they are ‘fighting the oppressive system’. The feminist magazine Spare Rib depicted the oppression faced by the Asian women as originating partly from the patriarchy within their culture and partly within their communities. The women were therefore regarded as heroic because they were challenging the expectations of both their culture and their community. In ‘Risking Gossip and Disgrace – Asian Women Strike’, Rossiter stated that it ‘takes a great deal of guts for an Asian woman to come out on strike’ because of the pressures placed on her by her family and community as it is a ‘dishonour for a woman to put herself in the public eye’. The attitudes shown towards the Asian women’s culture and community in Spare Rib demonstrate that the white feminist perspective was influenced by imperial attitudes with the assumption of western cultural superiority. Furthermore, by attributing the Asian women’s oppression to cultural factors they undermined the role of structural factors and the oppression faced by white women in their own communities, demonstrating the limitations of Western feminism in the late 1970s. In conclusion, the ethnicity of the strikers was a central focus in the media representation. Although the different media types are representative of a range of political ideologies, they are all written from an ethnocentric perspective. The media focused on the exoticism of the strikers by emphasising aspects of the South Asian women’s appearance which acted as signifiers of their ethnicity. The emphasis on the exoticism of the strikers enabled the media to attract interest in the dispute among the predominantly white audience, who constructed the strikers as different from themselves. The reinforcement of stereotypes enabled the media to use the dispute to maintain their vision of social order, constructing the women as exotic to prevent them from being taken seriously as workers and political actors. This demonstrates the difficulties faced by the media in coming to terms with the increasingly diverse nature of Britain’s workforce, resulting in the reinforcement of imperial attitudes towards the strikers. The representation of gender will now be discussed with a focus on the construction of femininity of the South Asian women and the contrast with the masculine crowd of Trade Unionists. The media representation of Grunwick largely reflects the assumptions about gender differences that are noted by Mulvey. Here, women ‘stand in patriarchal culture as a signifier for the male other’ as opposed to creating meaning for themselves. Furthermore, in the act of looking, Mulvey notes that the female is always ‘passive’ while the male is always ‘active’. Assumptions about female passivity and masculine activeness were reinforced in the media representation of the Grunwick dispute. The Asian female was depicted as more feminine than the white female, demonstrating the importance of intersectionality due to the influence of racial constructions on gender identity. In the context of Grunwick, the media represented the white women as active participants because of their involvement in the violent confrontations with the police. The Asian women, however, were represented as passive bystanders. The stereotype of a passive and ultra-feminine Asian woman was also based on imperial constructions. Imperial discourse justified colonisation by constructing Asian women as ‘passive subjects of patriarchal authority’ who were in need of ‘saving’ by westerners. The stereotype of the ultra-feminine and passive Asian woman was therefore based on gendered, racialised and imperial constructions, emphasising the importance of intersectionality. According to Clemente, involvement in industrial disputes is regarded as a contradiction with traditional notions of feminine behaviour. Despite this, the media emphasised the femininity of the South Asian women, reinforcing the dominant assumptions of their passivity. The reinforcement of stereotypes suggests that the media may have perceived the Asian women’s involvement in the strike as a threat to their vision of social order because they challenged conceptions of the ‘other’ with respect to their race and gender. The stereotyping of Asian femininity was reinforced through an emphasis on their domestic and family role in media representations. The women were represented in relation to their husbands and children, which took away their individual agency in the dispute. The Guardian noted that Desai’s ‘eyes sparkle when she mentions her husband’, focusing on her romantic relationship with her partner rather than her involvement in industrial dispute. The Daily Mail also focused most intently on the domestic, private role of the strikers. The reference to Desai as an ‘Asian housewife’, for example, emphasised her domestic role and undermined her identity as a political activist and worker. In the same article the author noted that, ‘five young Asian girls on the picket line have found themselves husbands’, which suggests that marriage was the priority for these women rather than the political consequences of the dispute. Such representation, in the Daily Mail as well as The Guardian, prevented the women from being treated seriously as agents of the industrial dispute because of the reinforcement of traditional stereotypes of femininity. The right-wing media further reinforced the stereotypes of Asian femininity by focusing on the women still working in the factory. The actions of those who remained in work challenged the stereotype of the passive Asian woman less than the women striking. The Daily Mail and Daily Express both published articles entirely focused on the challenges faced by those women still working. Ward’s account of the dispute also placed emphasis on the remaining workers, who he patronisingly referred to as the ‘little Asian girls’ who were frightened by the harassment they faced from the mass pickets. Ward used his role as the protector of the remaining women workers to defend his actions in the dispute. He sought to use his account of Grunwick to pursue his vision of social order, in which the Trade Unions had less power and influence in society. Ward used the harassment faced by the remaining workers from the mass pickets as a metaphor to represent the potential fate of British society if the government did not intervene to reduce the power of the Trade Union movement. The reinforcement of stereotypes of Asian femininity, through Ward’s depiction of the remaining workers, made his overall argument more convincing to the reader, demonstrating the importance of a political agenda in representation. The media’s unwillingness to accept the Asian women’s active political role is further illustrated by the dominance of quotes from Mahmood Ahmed in representing the strike committee. As the right-wing press rarely presented the views of the strike committee this was most prominent in the left-wing press. Morning Star used a quote from Ahmed in ‘We’ll Be Back Says Court Defendants’ and ‘Grunwick: Resolution Not Enough’ to represent the strike committee. The absence of the women’s views suggests that the left-wing media privileged the opinions of men in the political sphere. Both of these articles also feature an image of Desai, suggesting that Morning Star was only interested in her multiple ‘otherness’, because it drew the attention of its readers. The representation of the strike committee in the left-wing media can be seen as a metaphor for the Trade Union movement’s largely superficial inclusion of women. This was despite the increased diversity of the labour force during the 1970s due, in large part, to the growth of the service sector, which increased employment opportunities for women. The absence of any representation of women’s political views is demonstrative of assumptions of separate gender roles, where men are regarded more suited to public roles, especially in the political sphere. The media representation of the strike committee can therefore be seen as reflective of the wider limitations of British society to adapt to the changing position of women during the 1970s. There were, however, exceptions in which the Asian women were presented as politically active by the left-wing media. Tribune described Desai as, ‘the most respected and toughest of the strike leaders’, challenging the stereotype of the passivity of Asian women by presenting her as a key political protagonist in the dispute. Some of the images used also challenged the dominant visual representation of the Asian women which only focus on their multiple ‘otherness’. The News Line used an image showing Dromey and the rest of the strike committee listening to Desai. The emphasis upon Desai’s central political role challenged the representation of a paternalistic relationship between Dromey and the strike committee in other articles, demonstrating the contradictory nature of the left-wing media’s representation of the strikers. The stereotype of the passive Asian women was challenged most significantly in Spare Rib’s representation of the dispute. The image of Desai in ‘Grunwick Seeks Support’ shows her speaking at a rally marking six-months of the dispute. 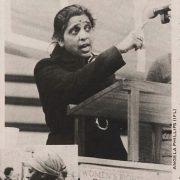 Desai was presented as politically active and central to the dispute, challenging the assumptions of passivity that are reinforced through the dominant visual representation of the women. The article also featured a quote from Desai, showing that they sought to represent the women’s political opinions rather than being interested solely in her multiple ‘otherness’. Spare Rib also challenged the assumptions of the active male versus the passive female. The article ‘We’re Getting Up Again Now’, for example, recognised that the women played a more active role in the picketing than the men. The magazine presented the women as active political protagonists because they sought to make women’s activism visible. Spare Rib also sought to utilise the dispute to challenge the sexism faced by women in the workplace and the Trade Union movement, to pursue their vision of a social order in which women were equal to men. By focusing, however, on the gender issues of the dispute, Spare Rib undermined the triple oppression the South Asian women faced because of their ethnicity and class position. Spare Rib’s representation of Grunwick demonstrates the limitations of Western feminism in prioritising gender discrimination over other forms of discrimination and consequently failing to recognise the importance of intersectionality. In relation to representations of gender, the dominant image of the familiar masculine crowd emphasised the femininity and ‘otherness’ of the South Asian women. The masculine crowd became the dominant focus of the media representation during the spring and summer of 1977 when support for the dispute from the Trade Union movement escalated, resulting in mass picketing. The representation of the masculine crowd, however, was dependent on the political ideology of the media type and the vision of the social order they sought to pursue. Taylor also reinforced the stereotypes of working-class masculinity through their description of the Trade Unionists stating that, ‘they marched in grey and brown working clothes…in a solid line of powerful arms that stretched from pavement to pavement’. The muscular strength of the men is reinforced through the reference to their powerful arms, contrasting with the fragility of the women. The dullness of their clothing also contrasts with the brightness of the Asian women’s saris, highlighting the exoticism and femininity of the South Asian women. In contrast, the right-wing media represented the masculine crowd negatively by focusing on the violence of the mass pickets because they wanted to destroy the reputation of the Trade Unionists to pursue their vision of social order in which the Union movement had less power. This representation, emphasising the violence of the masculine crowd, also highlighted the passivity of the women, demonstrating the importance of difference to create meaning. The Daily Express exaggerated the violence of the pickets stating that, ‘all the crowd were yelling: smash the fuzz’s brains out’. The visual representation also focused upon the masculine crowd’s violence and its consequences, such as the image of PC Wilson lying on the floor after he had been hit by a milk bottle. The right-wing media blamed Trade Unionists for the assault, despite a lack of evidence, to pursue their anti-Union agenda. The television coverage of the dispute similarly focused on the violence of the pickets. Television coverage was an important influence on the British public’s consciousness, especially due to the increased ownership of televisions during the 1970s. This suggests that the scenes of violence created a dominant image of the dispute in the public’s imagination, which contrasted starkly with the constructed passivity of the South Asian women. The absence of Asian men in the right-wing’s visual representations of the strike suggests that the media were selective in their representations because they sought to construct the strikers as feminine to invoke interest from their audience. The presence of Asian men would have disrupted the surprising elements of the strikers because they do not have the multiple ‘otherness’ of the Asian women. Therefore, the media representation highlights the exploitation faced by the female workers. The Daily Telegraph commented that the Scarman Report painted, ‘a Dickensian picture of Asian women being forced to work long hours’. Focusing on the exploitation faced by the women is likely to have evoked more sympathy from the audience because work is constructed as central to the masculine identity, unlike with feminine identity. The exploitation of women through their work, therefore, would be regarded as more shocking. In conclusion, the representation of gender across different media types was less consistent than the representation of ethnicity. Spare Rib represented the feminist perspective by challenging stereotypes of South Asian femininity through an emphasis on the women’s role as political activists. Nevertheless, the majority of the media represented the male perspective, reinforcing the stereotype of the passive Asian woman which was emphasised through a contrast with the masculine crowd. The emphasis on the femininity of the South Asian women in the media representation served the same purpose as the focus on their exoticism. It undermined their identity as workers and political activists. This suggests that the male dominated media struggled to come to terms with the changing position of women during the 1970s and therefore reinforced traditional conceptions of femininity in an attempt to maintain the gender hierarchy, which was integral to their vision of social order. Finally the representation of the identity of the South Asian women in relation to the construct of class will be discussed. Unlike the representation of ethnicity and gender, the media representation of class was more conflicted, due to the opposing political ideologies of the left and right-wing media. Before analysing the media’s representation, the self-identification of the women’s class position will be discussed. There are, however, only a limited range of sources that provide the perspective of the Asian women. McDowell et al. and Stevenson have highlighted this problem in the literature on industrial disputes involving women and have sought to bring greater historiographical focus on the perspectives of the participants. Stevenson focuses to a greater extent than McDowell et al. on how women involved in industrial disputes constructed their political identities. Despite being excluded by male workers and the male-dominated Trade Unions, Stevenson argues that these women constructed their identities, and situated their struggle, through a class-based, rather than a gendered, lens. An analysis of the pamphlets produced by the strike committee and quotes from the committee published in the left-wing media supports Stevenson’s argument in relation to Grunwick. The strike committee emphasised the shared position between themselves and the Trade Unionists stating that, ‘an injury for one is an injury for all’ in a pamphlet calling for a mass picket. Furthermore, they referred to the Trade Unionists as ‘brothers and sisters’ at the Communist Celebrations, emphasising their close relationship because of their shared class position. The strike committee also identified their class position through referring to themselves as workers, because waged employment is central to the construction of working-class identity. In a pamphlet produced by the strike committee they referred to ‘fellow workers’, emphasising their shared position with the Trade Unionists as a result of their employment position. The strike committee also emphasised their class position through constructing their struggle as part of the Trade Union movement, an institution of working-class identity. In a quote published in the Morning Star Desai stated that, ‘we must not give up our basic right to join the trade union movement…If we do, the trade union movement will have been defeated…this affects every worker in the country’. The strike committee sought to construct their identities through class because it enabled them to emphasise their shared position with the Trade Unionists to generate support. This emphasis consequently downplayed the importance of gender and ethnicity in the construction of their identities. As previously established, the media representation of the South Asian women generally undermined their identity as workers and subsequently their class position. There were, however, exceptions. In some articles the left-wing media constructed the identities of the women through a class lens to emphasise the shared position of the strikers and the Trade Unionists and to generate support from the Trade Union movement. Morning Star used the language of class to refer to the Asian women, describing them as part of the ‘vanguard’. The headline, ‘‘Grunwick: The Workers United, Will Never Be Defeated’ in the Socialist Worker emphasised the shared position as a result of the women’s identity as workers to foster support from Trade Unionists. The references to the strikers as their ‘brothers and sisters’ in the Socialist Worker further reinforced their shared class position. The accounts of the dispute written from the perspective of the Trade Unionists also emphasised the women’s working class position because they sought to present the Trade Union movement as more inclusive. The dispute occurred at the same time as the Trade Union movement was attempting to become more inclusive of women and minorities and to organise the increasingly diverse British labour force. Dromey and Taylor used the dispute to demonstrate that, ‘white workers could be mobilised in defence of their black and Asian brothers and sisters’. The use of ‘brothers and sisters’ shows that they sought to depict the strikers as part of the new working-class and emphasise the solidarity with those who belonged to the traditional working-class. The image of solidarity however is idealistic because it ignored the prominence of institutional racism and sexism within the Trade Union movement and the previous failures of the movement to mobilise in support of minority workers, such as the Mansfield Hosiery Strike (1972) and Imperial Typewriters Strike (1974). The left-wing media also presented the dispute as part of the wider class struggle to generate support from Trade Unionists. 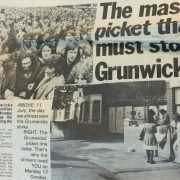 Morning Star wanted to make the Grunwick dispute ‘another Saltley’, referring to the miners’ strike of 1972, in an article persuading Trade Unionists to join the pickets. Thus, through focusing on the class issues of the dispute, the left-wing media sought to generate support from the Trade Union movement. By placing emphasis on class issues, however, the left-wing media’s representation of the dispute resulted in a lack of focus on the issues of sexual and racial discrimination that were also central. Socialist Worker stated that the, ‘issue at stake was simple: trade union recognition’, ignoring the issues which did not personally affect the predominantly white male Trade Unionists. The lack of acknowledgment of the gender dimension of the dispute is illustrated through the statement, ‘we are right behind the lads’ from a miner involved in the mass pickets. The use of ‘lads’ shows that the miner regarded the dispute as being about worker’s rights rather than women and minority rights. The left-wing media’s representation of the dispute is reflective of how the Trade Union movement used the dispute to further their own agenda in their fight for Union recognition and failed to address the issues of sexual and racial workplace discrimination. Notwithstanding the left-wing media, the press more broadly undermined the importance of class in the construction of the identity of the South Asian women, demonstrating the conflicted nature of representation. The right-wing media in particular ignored the class position of the strikers because they did not want to present them as unified with the Trade Unionists. 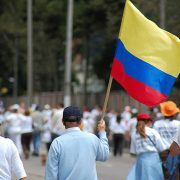 Representing the Trade Unions as inclusive of women and minorities would contradict the negative image of the movement, which the right-wing sought to portray. Instead, the Right emphasised the gender and ethnicity of the Asian women to represent them as separate from the predominantly white and male Trade Unionists. The Evening Standard clearly attempted to differentiate the women from the rest of the Trade Unionists by referring to them as, ‘the real pickets’ in, ‘the streets where mob law prevails’. The newspaper was therefore able to pursue an anti-union agenda by emphasising the violence of the ‘mob’ while also appearing sympathetic to the women. In contrast to the left-wing media, the right-wing sought to challenge the representation of the dispute as a class struggle by emphasising the social diversity of the pickets. The Evening Standard focused on the individuals who were not part of the Trade Union movement, describing the pickets as including, ‘every other rag-tag off-bod imaginable’. This representation of the pickets as a mass of disorganised individuals contrasted with the image presented in the left-wing media of a united mass of Trade Unionists. The Daily Express also emphasised the social diversity of the pickets, stating that many of those involved were, ‘children of the middle class’. In the article, the ‘real working class’ were identified as the remaining workers, who were harassed by the middle-class pickets in, ‘the oddest and sourest paradox of all’. This suggested ‘paradox’ was used by the Daily Express to contradict the image presented in the left-wing media of the dispute as a unified class struggle against the management. Overall, the emphasis on the social diversity of the pickets was used by the right-wing press in an attempt to prevent their cause from being taken seriously. The media representation as a whole failed to acknowledge the more complex class position of the South Asian women as a result of their migratory history. The majority of the workers at Grunwick migrated to Britain from East Africa, where they were of a middle-class position. Furthermore, the majority of the South Asian women had not been employed before coming to Britain, instead taking responsibility for the household and the care of children. The South Asian men were therefore the breadwinners and were generally self-employed in the mercantile and administrative sectors. Following their forced migration to Britain, largely as a result of de-colonialisation, the circumstances of the South Asian men and women were extremely different in comparison to their lives in East Africa. South Asian women were obligated to find employment because their partner’s wage alone was insufficient to support the family. Therefore, as a result of migration, the position of these women was transformed to that of ‘workers’. However, as Wilson notes, it took time for these women to adjust to their new position and identify themselves as workers. The past experiences of the women and the intersection with their current geographical and structural location were therefore important in the way in which they constructed their identities. There are very few references acknowledging the women’s complex migratory history, referring to them as ‘East African Asians’ or noting that Desai migrated from Tanzania. These references, however, merely show acknowledgement of their migratory history rather than the implications of this history to the identities of the women involved. Instead, the women were often referred to as ‘immigrants’. 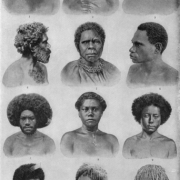 This term generalises groups of people of different social, economic, racial and cultural identities and overlooks their unique migratory histories. The complexities of the Asian women’s identities was therefore overlooked in the media representation. In conclusion, the representation of class differed depending upon the agenda of the article and the political ideology of the newspaper, demonstrating the conflicted nature of the media’s representation in relation to class. The left-wing emphasised the women’s working-class identity to generate support from Trade Unionists and consequently utilised the dispute to pursue their vision of social order, in which the working-class had greater collective power within society. The right-wing media however, undermined the importance of class in the construction of the identity of the women to separate them from the Trade Unionists and subsequently undermined the unified nature of the struggle. In using the representation of the dispute to pursue their own political agendas, the media undermined the complexity of the women’s identity, a result of their migratory histories, and the implications this had for their class associations. The extent to which the contemporary representation of South Asian women has changed from their characterisation during Grunwick will now be assessed. McDowell et al. analysed the media representation of the Asian women involved in the Gate Gourmet Strike in 2005 to demonstrate the persistence of the construction of Asian women as the exotic ‘other’ rather than as workers. The media representation of the 40th anniversary of the strike will be the focus of this section, which seeks to develop the discussion of memory started by McDowell et al. Most prominent in the media representations commemorating the strike is the use of the term ‘strikers in saris’ to describe the women. The curators of the ‘We are the Lions’ (Grunwick40) exhibition stated on their twitter account that they ‘wish people/media would stop using the ‘othering’ term as it ‘only serves to exoticise and patronise’. 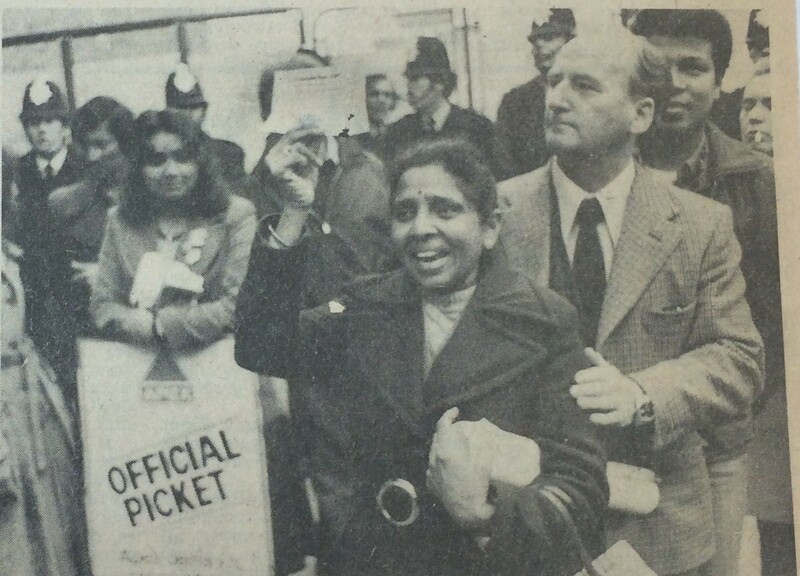 Interestingly the curators of the Grunwick40 exhibition and the articles commemorating the dispute noted that the term ‘strikers in saris’ was a common description used in news coverage of the dispute. My own research, however, found no examples of the use of this term in the media representation. This is not to say that the term was not coined at the time but it cannot be regarded as a common description. Nevertheless, the term ‘strikers in saris’ does encompass the themes that were prominent in the media representation at the time, particularly the focus on the appearance of the women. The content of the commemorative articles further proves the persistence of Asian women as the exotic ‘other’. The article in The Economist states that the activism of the women ‘smashed stereotypes of submissive suffering Asian women’. Nevertheless, references are still made to Desai’s ‘diminutive’ size and her sari, demonstrating the persistence of exoticising in media representation. The Guardian also focuses on Desai’s appearance, describing her as ‘tiny and birdlike’, demonstrating the persistence of the emphasis on fragility in media representations. 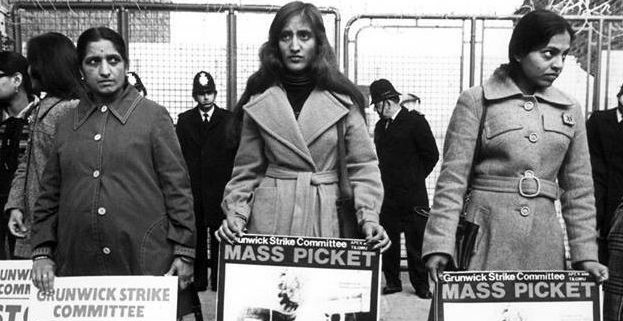 The prominence of the term ‘strikers in saris’ and further evidence of ‘othering’ in the commemorative media representation of Grunwick demonstrates the persistence of ‘othering’ in contemporary Britain. This demonstrates that British society is still characterised by its imperial past and has struggled in transitioning to a post-imperial, multi-racial society. Unlike the majority of commemorative media representation the ‘We are the Lions’ exhibition purposefully avoids using the term ‘strikers in saris’. The curator of the exhibition stated that, ‘we deliberately tried to avoid patronising the women involved as a lot of the accounts are quite paternalistic’. Respect for the strikers is demonstrated by the focus within the exhibition on their identity as workers and political activists. The exhibition demonstrates that although Britain has struggled to transition to a post-imperial state, there are opportunities to challenge the role of ‘othering’ in contemporary society. In conclusion, the media representation of the South Asian women involved in the Grunwick dispute undermined their position as workers and political activists. Despite their involvement in the industrial dispute, the media reinforced stereotypes of the exotic and passive ‘other’, focusing on constructions of gender and ethnicity as opposed to the construction of class. The constructs of gender and ethnicity were deeply intertwined in the representation of the women’s identity, leading to largely similar conclusions for each of these chapters. The persistence of traditional conceptions of Asian femininity demonstrates the power of stereotypes as a form of representation in fixing meaning and consequently maintaining the media’s vision of social order. The media representation of Grunwick is therefore demonstrative of Hall’s ‘Theory of Representation’. As has been shown in throughout this article, however, media types had different visions of social order as they were written from diverse gender and class perspectives and had different political ideologies. Therefore, although they were written and interpreted within the same dominant system of meaning, there were significant differences in their representation. The media emphasised different aspects of the women’s identity to pursue their wider political agendas. Hall’s use of ‘the media’ as an umbrella term can therefore be questioned due to the contrasting visions of the social order embedded in the different media types. Despite the differing visions of social order, there are considerable similarities in the representation of the women in the media across the political spectrum. The similarities are due to the media types all having been produced from an ethnocentric perspective. 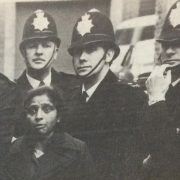 The media sought to maintain their vision of the social order, in which western superiority was central, through the use of patronising stereotypes in their representation of the South Asian women involved in the Grunwick dispute. The use of stereotypes undermined the complexity of the women’s identities, a complexity formed from intersectionality and complex migratory histories. In further research it would be fruitful to explore the representation of the women in a range of sources produced from a minority perspective. Comparisons could then be made between the representation from an ethnocentric perspective and a minority perspective. However, due to the dominance of ethnocentric sources available in the archives, potential for such research could be limited. Regarding the wider significance, the media representation of Grunwick can be used as a lens through which to explore the difficulties that 1970s British society faced in transitioning to a post-colonial society. Rather than losing the empire in a ‘fit of absence’, the persistence of imperial attitudes in the media representation of the women shows that post-colonial Britain remained characterised by its imperial legacy, especially in the cultural sphere. The consistent reinforcement of western superiority demonstrates that the media, representative of British society more broadly, found it difficult to come to terms with a reduced global role. By reinforcing stereotypes of the ‘other’ the media representation of ethnic minorities shows that British society found it difficult to come to terms with the influx of migrants as a consequence of de-colonisation. Furthermore, the reinforcement of traditional conceptions of femininity demonstrates that society found it difficult to accept the changed position of women in British society because it challenged the gender hierarchy, which was integral to the male-centric vision of the social order. Regarding further research, it would be interesting to explore the extent of the persistence of imperial attitudes in contemporary media representation of minority groups involved in labour disputes. 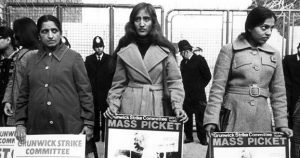 The media coverage of the Grunwick dispute’s fortieth anniversary demonstrates that patronising and exoticising stereotypes, which were reinforced at the time of the dispute, still persist. Further research would seek to investigate whether these stereotypes are reinforced in the representation of contemporary labour disputes involving minorities, such as the SOAS Justice for Cleaners campaign and the strike action by Deliveroo drivers. The curators of the Grunwick40 exhibition make parallels between these current industrial disputes to demonstrate the long-standing influence of Grunwick in the British labour movement, particularly for minority groups. Further research would explore these parallels in greater depth, by comparing the media representation between Grunwick and these current disputes. A comparative approach would develop the research of McDowell et al. who demonstrated the persistence of stereotypes by drawing parallels between the media representation of Grunwick and Gate Gourmet. It would be important to consider the transformation that British society has experienced since the 1970s, including the decline of the labour movement and the rise of the ‘gig’ economy. Nevertheless, a comparative approach could still be used to explore the extent to which British society is still struggling to come to terms with its post-colonial identity. Figure 1: Desai in front of policemen. Source: ‘The Sweatshop Protection Racket’, Socialist Worker, 18th June 1977, p.3. Figure 2: ‘Mr Rees, Home Secretary, listening to pickets outside the Grunwick gates yesterday’. Source: S. Tendler & C. Seton, ‘Pickets Jeer Mr Rees on Visit to Factory’, The Times, 28 June 1977, p. 2. Figure 3: Pickets stood outside the Grunwick factory gates. Source: J. Dale, ‘Pictures of Hate on the Photo-Strike Picket Line’, Daily Mail, 15 June 1977, p. 9. 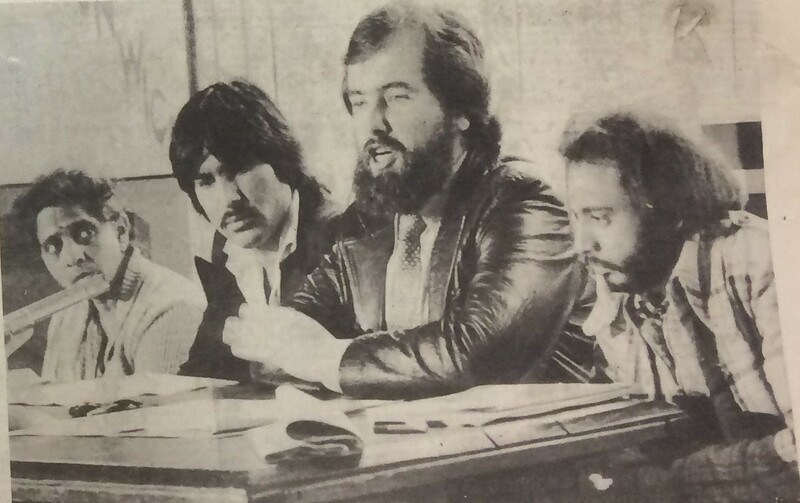 Figure 4: Grunwick strike leaders at a news conference after the Scarman report was issued. Source: News Line Reporter, ‘Scarman Report: Let Grunwick Strikers Back’, The News Line, 26 August 1977, p. 8. Figure 5: The Communist Party’s General Secretary stood behind Desai with his hand on her arm. Source: H. Hewland, ‘New Tactics by Police’, Morning Star, 23 June 1977. Figure 6: Desai speaking at a rally marking the six-month duration of the dispute Source: Spare Rib Reporter, ‘Grunwick Seeks Support’, Spare Rib, Issue 57, April 1977, p. 21. Figure 7: Article presenting an image of the masculine crowd alongside an image of South Asian women stood in a relaxed manner beside the gates of the factory. Source: Socialist Worker Reporter, ‘The Mass Picket That Must Stop Grunwick’, Socialist Worker, 14 October 1977. An exhibition commemorating the Grunwick strike was held at Brent Museum and Archive between October 2016 and March 2017. Ethnicity in the “Great Grunwick Strike”, London, UK, 1976–1978’, Women’s History Review, 23/4, (2014), p. 600. Lord Justice Scarman, Report of a Court of Inquiry into a dispute between Grunwick Processing Laboratories Ltd and members of the Association of Professional, Executive, Clerical and Computer staff, CMND 6922, Sessional Papers, (London: HMSO, 1977). J. Rogaly, Grunwick, (Harmondsworth, 1977), p. 135. B. W. Napier, ‘Grunwick and After’, The Cambridge Law Journal, 37/1, (1978), p. 32. G. Ward, Fort Grunwick, (London, 1978), pp. 121-23. G. Taylor & J. Dromey, Grunwick: The Workers’ Story, (London, 2nd Ed., 2016), p. 211. A. Wilson, Finding a Voice: Asian Women in Britain, (London, 1978), p. 54, 56. J. McGowan, ‘“Dispute”, “Battle”, “Siege”, “Farce?” Grunwick 30 Years On’, Contemporary British History, 22/3, (2008), p. 401, 384. R. Pearson, S. Anitha & L. McDowell, ‘Striking Issues: From Labour Process to Industrial Dispute at Grunwick and Gate Gourmet’, Industrial Relations Journal, 40/1, (2010), pp. 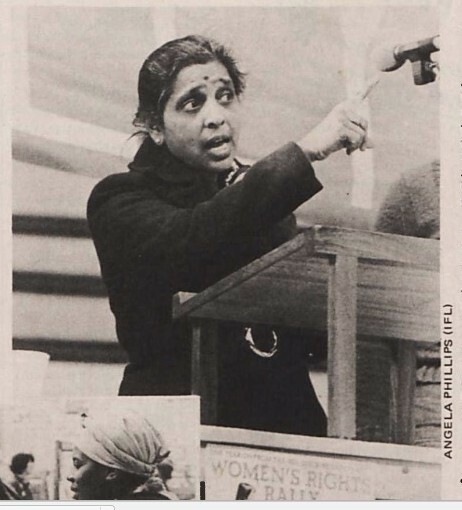 408–428; L. McDowell, S. Anitha, & R. Pearson, ‘Striking Similarities: Representations of South Asian Women’s Activism in the UK’, Gender, Place and Culture, 19/1, (2012), pp. 133-152; McDowell, Anitha & Pearson, ‘Striking Narratives’, pp. 595-619. McDowell, Anitha & Pearson, ‘Striking Narratives’, p. 596. S. Ward (Ed. ), British Culture and the End of Empire, (Manchester, 2001), p. 1. S. Hall, Representation: Cultural Representations and Signifying Practices, (London, 1997). Hall, Representation, p. 259, 3, 258, 37, 234. M. Omi, & H. Winant, Racial Formation in the United States, (London, 2015), p. 106. Omi, & Winant, Racial Formation, p. 105. W. Webster, Englishness and Empire, 1939-1965, (Oxford, 2005), p. 2. S. Lahiri, ‘South Asians in Post-Imperial Britain: Decolonisation and Imperial legacy’, in S. Ward (Ed. ), British Culture and the End of Empire, (Manchester, 2001), p. 210. D. Cannadine, ‘Introduction’, in S. Ward (Ed. ), British Culture and the End of Empire, (Manchester, 2001), p. 3. M. Barnard, Fashion as Communication, (London, 2nd Ed., 2002), p. 37. F. Saussure in Hall, Representation, p. 32. D. Purgavie, ‘It’s All Aboard the Picket Special for Red Roses and Abuse’, Daily Mail, (21/06/1977), pp. 20-21. D. Clemente, ‘Striking Ensembles: the Importance of Clothing on the Picket Line’, Labor Studies Journal, 30/1 (2006), p. 1. G. Taylor, ‘Sari Power’, Morning Star, (24/11/1976), in Taylor & Dromey, Grunwick, p. 70. F. Draper, ‘The Streets Where Mob Law Prevails’, Evening Standard, (23/06/1977), p. 6. Time Magazine, (July, 1978), in McDowell, Anitha & Pearson, ‘Striking Narratives’, p. 607. Taylor & Dromey, Grunwick, p. 36. Lahiri, ‘South Asians’, p. 205. B. Brooks, ‘Grunwick Strikers Call It A Day’, Morning Star, (15/07/1978), p. 1. R. Parker, ‘Picket Organiser Regarded as a Father Figure’, The Times, (25/06/1977), p. 2. M. Webster, ‘Jack Dromey…Tough Man Behind the Line’, Evening Standard, (11/07/1977), p. 3. ‘A Senseless Tumult in the Streets…’, Guardian, (25/06/1977), p. 6. N. Puwar & P. Raghuram, South Asian Women in the Diaspora, (Oxford, 2003), p. 24, 28. A. Rossiter, ‘Risking Gossip and Disgrace – Asian Women Strike’, Spare Rib, 54, (January, 1977), p. 18. Puwar & Raghuram, South Asian Women, p. 26. L. Mulvey, Visual and Other Pleasures, (Basingstoke, 2nd Edition, 2009), p. 14. Mulvey, Visual and Other Pleasures, p. 19. Puwar & Raghuram, South Asian Women, p. 24. Clemente, ‘Striking Ensembles’, p. 5. S. Anitha, R. Pearson, & L. McDowell, ‘Striking Lives: Multiple Narratives of South Asian Women’s Employment, Identity and Protest in the UK’, Ethnicities, 12/6, (2008), p. 760. 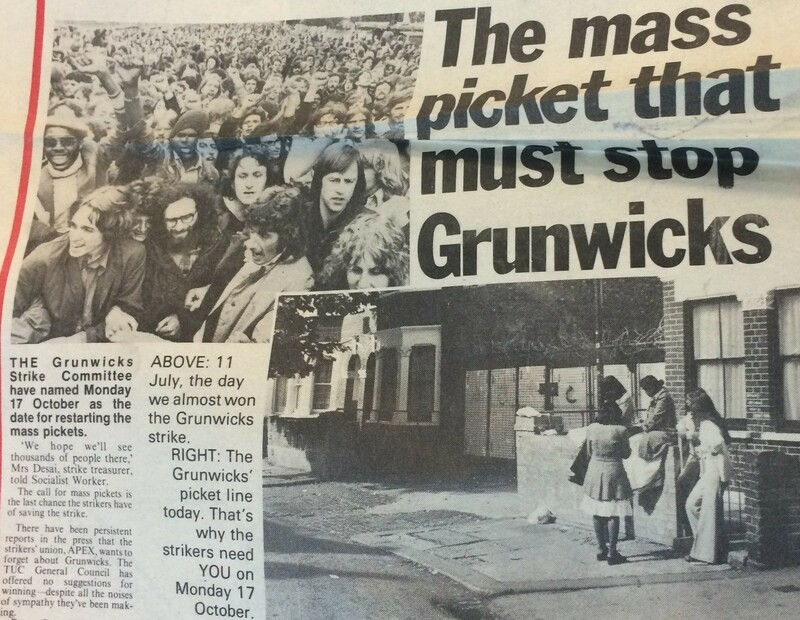 ‘We Fight On, Says Grunwick Picket’, Guardian, (18/01/1978), p. 4. J. Steeples, ‘How Little Difference a Year Makes on the Grunwick Line’, Daily Mail, (23/08/1977), p. 9. Steeples, ‘How Little Difference’, p. 9. Purgavie, ‘It’s All Aboard the Picket’, pp. 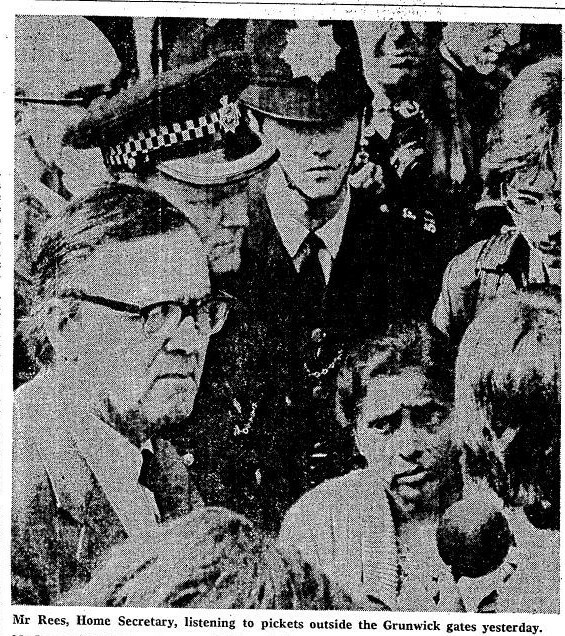 20-21.; G. Bowd & A. Hendry, ‘Aboard the Grunwick Bus’, Daily Express, (21/06/1977), p. 16. Ward, Fort Grunwick, p. 52. ‘We’ll Be Back Says Court Defendants’, Morning Star, (22/08/1977); ‘Grunwick: Resolution Not Enough’, Morning Star, (07/09/1977). A. Beckett, When the Lights Went Out: Britain in the Seventies, (London, 2009), p. 367. Beckett, When the Lights Went Out, p. 367. J. Spencer, ‘Grunwick Mail: New Talks on Blacking’, The News Line, (27/10/1977), p. 3. N. Myers & B. Campbell, ‘We’re Getting Up Again Now’, Spare Rib, 63, (October, 1977), p. 31. Myers & Campbell, ‘We’re Getting Up’, p. 31. Reference to ‘sexist treatment of women workers’ in ‘Grunwick’s Still Defiant’, Spare Rib, 55, (February, 1977), p. 30. McDowell, Anitha & Pearson, ‘Striking Narratives’, p. 611. ‘Beautiful Morning’, Socialist Worker, (16/07/1977), p. 3. A. Baron, ‘Masculinity, the Embodied Male Worker and the Historian’s Gaze’, International Labour and Working-Class History, 69, (2006), p. 146, 150. Taylor & Dromey, Grunwick, p. 158. R. Barthes in Hall, Representation, p. 39. 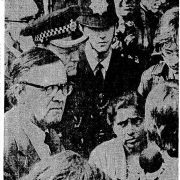 A. Walton, ‘The Grunwick Strike’s Bloodiest Day’, Daily Express, (24/06/1977), p. 19. P. Burden, ‘A Blot on Britain’, Daily Mail, (24/06/1977), p. 1. McDowell, Anitha & Pearson, ‘Striking Narratives’, p. 604. L. McDowell, Redundant Masculinity? Employment, Change and White Working-Class Youth, (Oxford, 2003), p. 58. McDowell, Anitha & Pearson, ‘Striking Narratives’, p. 596.’ G. Stevenson, ‘The Forgotten Strike: Equality, Gender and Class in the Trico Equal Pay Strike’, Labour History Review, 81/2, (2016), p. 144. G. Stevenson, ‘The Women’s Movement and “Class Struggle”: Gender, Class Formation and Political Identity in Women’s Strikes, 1968-78’, Women’s History Review, 25/5, (2016), p. 742. Stevenson, ‘The Women’s Movement’, p. 742. ‘The Strike Committee Calls for a Mass Picket’, http://www.striking- women.org/sites/strikingwomen.org/files/Fxt5fhlAwWe5U5vfxKorsxtlrQQ51wanEeXEHoY_vnU_0.jpeg, Accessed: 27/04/2017. Grunwick Factory Dispute: Communist Party Jubilee Celebrations, LBC/IRN, Date Unknown. ‘The Strike Committee Calls for a Mass Solidarity Action by Trade Unions’, <http://www.striking-women.org/sites/striking- women.org/files/ZqR2_tGRlXxUsjlTCjRNt9cb7hGESN1JLwabXeOeDKQ%2CA8wOA pI20KOqmGUivBN2DkgAIxEpAKXzO4tzwwH6Cw%2Cit_wrILa4OJEOV6pvcxaNCrqqluVaV8LAnw0YGvlO3E.jpeg>, Accessed 27/04/2017. P. Gilroy, There Ain’t No Black in the Union Jack: The Cultural Politics of Race and Nation, (Abingdon, 2nd Ed., 2002), p. 7. P. Mantle, ‘Pickets Pour in for Grunwick’, Morning Star, (18/10/1977), p. 1. McDowell, Anitha & Pearson, ‘Striking Narratives’, p. 600. ‘Grunwick: The Workers United, Will Never Be Defeated’, Socialist Worker, (02/07/1977), p. 1. ‘The Morning the Rank and File Stopped Grunwick’, Socialist Worker, (16/07/1977), p. 1. Taylor & Dromey, Grunwick, p. 31. Taylor & Dromey, Grunwick, p. 211. Beckett, When the Lights Went Out, p. 369. ‘Grunwick: Post Aid Stepped Up’, Morning Star, (17/06/1977), p. 1. ‘Grunwick Factory Dispute – Interview with Mick McGahey’, LBC/IRN, Date Unknown. ‘Grunwick is a Litmus test, Perhaps a Turning Point in our Political and Constitutional life’, Socialist Worker, (25/06/1977). P. Parmar, ‘Gender, Race and Class: Asian Women in Resistance’ in Studies for Contemporary Cultural Studies (Ed. ), The Empire Strikes Back: Race and Racism in 70s Britain, (London, 1982), p. 268. Draper, ‘The Streets’, p. 6. ‘Yes, This Is A Class Issue’, Daily Express, (24/06/1977), p. 10. ‘Yes, This Is A Class Issue’, p. 10. Wilson, Finding a Voice, p. 12. Taylor & Dromey, Grunwick, p. 4. Wilson, Finding a Voice, p. 51. Anitha, Pearson & McDowell, ‘Striking Lives’, p. 767. Rossiter, ‘Risking Gossip’, p. 18.; ‘How the Trouble Flared Up During a Long Hot Summer’, Daily Mail, (26/08/1977), p. 9.; ‘The Grunwick Show – Grunwick Factory Dispute’, LBC/IRN, (19/10/1977). Times Editor, ‘Where Else Will They Get Jobs?’, The Times, (30/06/1977); G. Fallows, ‘Portrait of a Picket Line’, Daily Mirror, (14/06/1977), p. 1. McDowell, Anitha & Pearson, ‘Striking Similarities’, p. 134. ‘Remembering the Grunwick Dispute: The Strike that Brought Immigrant Women into Britain’s Working Class’, The Economist, (25/11/2016), <http://www.economist.com/blogs/prospero/2016/11/remembering-grunwick-dispute>, Accessed 07/04/2017. S. Mansoor, ‘How Asian Women Made Trade Union History and Shattered Stereotypes’, Guardian, (20/01/2010), p. 1. Lahiri, ‘South Asians in Post-Imperial Britain’, p. 214. Author’s Email Correspondence with Chair of Grunwick40 (S. Aurora), 03/02/2017. Webster, Englishness and Empire, p. 3. Lord Justice Scarman, ‘Report of a Court of Inquiry into a dispute between Grunwick Processing Laboratories Ltd and members of the Association of Professional, Executive, Clerical and Computer staff’, Cmnd 6922, Sessional Papers (London: HMSO, 1977). Napier, B. W., ‘Grunwick and After’, The Cambridge Law Journal, 37/1 (1978), pp. 32-37. Phizaclea, A. & Miles, R., ‘The Strike at Grunwick’, New Community, 6/3 (1978), pp. 275–283. Rogaly, J., Grunwick (Harmondsworth, 1977). Sivandan, A., A Different Hunger (London, 1977). Taylor, G. & Dromey, J., Grunwick: The Workers’ Story (London, 2nd Ed., 2016). Ward, G., Fort Grunwick (London, 1978). Wilson, A., Finding a Voice: Asian Women in Britain (London, 1978). Look Back at Grunwick (Dir. Chris Thomas, 1977). The Great Grunwick Strike 1976–1978 (Dir. Chris Thomas, 2007). Anitha, S. & Pearson, R., ‘Striking Women’, (2013), <www.striking-women.org>. Bethan, B. & Shabnam, M., ‘Grunwick Dispute: What Did the ‘Strikers in Saris’ Achieve?’, BBC News, (10/09/2016), <http://www.bbc.co.uk/news/uk- england-london-37244466>. Mansoor, S., ‘How Asian Women Made Trade Union History and Shattered Stereotypes’, Guardian, (20/01/2010), pp. 1–2. ‘Remembering the Grunwick Dispute: The Strike That Brought Immigrant Women into Britain’s Working Class’, The Economist, (25/11/2016), <http://www.economist.com/blogs/prospero/2016/11/remembering-grunwick- dispute>. ‘Strikers in Saris’, The Guardian Society, (20/01/2010), <https://www.theguardian.com/society/gallery/2010/jan/20/grunwick-strike- women>. ‘We are the Lions’ Exhibition Commemorating the Grunwick Strike Held at Brent Museum and Archive between October 2016 and March 2017. Anitha, S., Pearson, R. & McDowell, L., ‘Striking Lives: Multiple Narratives of South Asian Women’s Employment, Identity and Protest in the UK’, Ethnicities, 12/6 (2008), pp. 654-775. Anitha, S. & Pearson, R., ‘Striking Women: Striking Out’, Feminist Review, 108/1 (2014), pp. 61-70. Banks, M., Visual Methods in Social Research (London, 2001). Barnard, M., Fashion as Communication (London, 2nd Ed., 2002). Baron, A., ‘Masculinity, the Embodied Male Worker and the Historian’s Gaze’, International Labor and Working-Class History, 69 (2006), pp. 143-60. Beckett, A., When the Lights Went Out: Britain in the Seventies (London, 2009). Berger, J., Ways of Seeing (London, 2nd Ed., 2008). Black, L., Pemberton, H. & Thane, P (Eds. ), Reassessing 1970s Britain, (Manchester, 2015). Burkett, J., Constructing Post-Imperial Britain: Britishness, ‘Race’ and the Radical Left in the 1960s (London, 2013). Centre for Contemporary Cultural Studies, The Empire Strikes Back: Race and Racism in 70s Britain (London, 1982). Labor Studies Journal, 30/1 (2006), pp. 1–15. Gilroy, P., There Ain’t No Black in the Union Jack: The Cultural Politics of Race and Nation (Abingdon, 2nd Ed., 2002). Hall, C., Civilising Subjects: Metropole and Colony in the English Imagination, 1830–1867 (Chicago, 2002). Hall, S., Representation: Cultural Representations and Signifying Practices (London, 1997). McClintock, A., Imperial Leather: Race, Gender and Sexuality in the Colonial Context (London, 1995). McDowell, L., Redundant Masculinity? Employment, Change and White Working- Class Youth (Oxford, 2003). McDowell, L., Anitha, S. & Pearson, R., ‘Striking Similarities: Representations of South Asian Women’s Activism in the UK’, Gender, Place and Culture, 19/1 (2012), pp. 133–152. 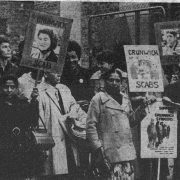 McDowell, L., Anitha, S. & Pearson, R., ‘Striking Narratives: Class, Gender and Ethnicity in the ‘Great Grunwick Strike’, London, UK, 1976–1978’, Women’s History Review, 23/4 (2014), pp. 595-619. McGowan, J., ‘’Dispute’, ‘Battle’, ‘Siege’, ‘Farce’? Grunwick 30 Years On’, Contemporary British History, 22/3 (2008), pp. 383-407. Mulvey, L., Visual and Other Pleasures (Basingstoke, 2ND Ed., 2009). Omi, M. and Winant, H., Racial Formation in the United States (London, 2015). Paul, K., Whitewashing Britain: Race and Citizenship in the PostWar Era (London, 1997). 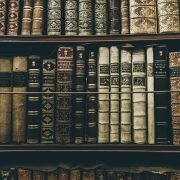 Pearson, R., Anitha, S. & McDowell, L., ‘Striking Issues: From Labour Process to Industrial Dispute at Grunwick and Gate Gourmet’, Industrial Relations Journal, 40/1 (2010), pp. 408–428. Puwar, N. and Raghuram, P., South Asian Women in the Diaspora (Oxford, 2003). Schwarz, B., ‘“The Only White Man in There”: The Re-Racialisation of Britain, 1956-68’, Race and Class, 38/1 (1996), pp. 65-78. Solomos, J., Race and Racism in Britain (Basingstoke, 3rd Ed., 2003). Stevenson, G., ‘The Forgotten Strike: Equality, Gender, and Class in the Trico Equal Pay Strike’ Labour History Review, 81/2 (2016), pp.141-169. Stevenson, G., ‘The Women’s Movement and ‘Class Struggle’: Gender, Class Formation and Political Identity in Women’s Strikes, 1968–78’, Women’s History Review, 25/5 (2016), pp. 741-755. Thompson, A. (Ed. ), Britain’s Experience of Empire in the Twentieth Century (London, 2012). Ward, S. (Ed. ), British Culture and the End of Empire (Manchester, 2001). Webster, W., Englishness and Empire 1939-1965 (Oxford, 2005). Winant, H., ‘Race and Race Theory’, Annual Review of Sociology, 26/1 (2000), pp. 169-185. Winder, R., Bloody Foreigners: The Story of Immigration to Britain (Oxford, 2004).